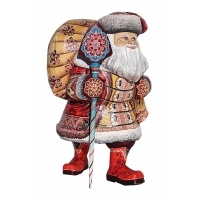 This wooden Santa is hand carved and hand painted in Russia, signed by the artist. Santa is about.. This wooden Santa Claus is hand carved of linden-tree and hand painted in Russia. It is 4.3' high.. This wooden Santa Claus is hand carved of linden-tree and hand painted in Russia. It is 7' high. .. This beautiful wooden doll is hand made and hand painted in Russia. It consists of 5 pieces. Doll..
Beautiful Wooden Nutckracker is hand carved of linden-tree and hand painted in Russia. Mouth ..